Is the dating advice you’re getting confusing you or causing you stress or anxiety? Does the advice seem of sync with your values? Are you NOT dating and need to jumpstart your efforts? Is it time to put more focus on finding the right relationship that will lead to marriage? Are you tired of doing all this work and still you are not meeting the right person for dating who wants commitment and marriage? Take charge of your dating efforts and learn an approach to meeting people who share your values so you can meet the right person for the life you truly desire. I coach with motivated individuals who are looking for a marriage (committed exclusive) life partner whether they have never married, are widowed, or divorced. Create a targeted, effective dating plan so you can find your true love partner and finally live the life you envision with that special person. Increase the opportunity for a love connection with the right one based upon shared key relationship values leading you to everlasting true love. Gain a sense of flow with the dating process and no longer feel as though it is a struggle. Find renewed hope that you can find that special person with whom to build a life! What has been most successful for my clients is to take a look at their dating experience in the context of their whole life. And my clients have full, busy lives where coaching helps give them focus in order to increase their chances of having a successful significant relationship that leads to marriage. My personal clients who have had the best results have worked with me in a committed coaching relationship for several months- even until the wedding and beyond! To begin, I offer customized coaching packages where we start off with a two hour Discovery Session. In this session, I will start clarifying your values, a fundamental part of the coaching that is the basis for finding true love. After that session, we will meet in person or on the phone twice a month for five months As one of my private clients I review your internet dating profile, my most sought after consulting service! As a prerequisite, my one-on-one clients are committed to the coaching process for a minimum of nine sessions. To have an exploratory conversation with me to see if private coaching is right for you, please fill out my brief Get to Know You Survey. Talk with Coach Amy. Since I have a limited number of spots open for individual coaching, at that time I will also let you know my next available opening. Do you wish you could have a day to focus on you and your potential for a love life? Does your love life need an immediate overhaul? Jumpstart your dating life with a day with me either in person or virtually by phone or via Zoom. This 6-hour coaching program is designed for those who want to transform their dating efforts and want to see quick results. You can do this program over one day if you have the stamina or over 3 months. If you choose the single-day program, we would meet in person or over Zoom and during that time, I will take you through the same program I teach my clients in the 3-month program. That includes: getting your values lined up so you attract people who want the same from a loving relationship that you do. We look at your path to success and create a personalized dating plan that includes where to meet people, how to feel more confident and attractive, what’s blocking you from finding true love and more. If you want to do the program more slowly, we can cover the same topics over three months in a plan that’s custom made to fit your schedule. In addition to the 6 hours of personalized coaching, we do 2 30-minute followup calls to make sure you stay on track. To have an exploratory conversation with me to see if the Fast Track to True Love Coaching is right for you. Please fill out my brief “Get to Know You” questionnaire on Talk with Coach Amy. I often have a waiting list given the limited number of spots open for Fast Track Coaching so please let me know if you’re interested and what your needs truly are so I can respond with a plan. Do you enjoy the synergy and support you get from being a group of your peers? Do you get the best results when you commit to show up for a group program where you have worked on your homework prior to the class? If so, then you will love participating in the Motivated to Marry Dating Secrets Group Coaching program. Here I will teach you my proprietary Motivated to Marry® system for finding lasting love in a series of weekly live coaching calls with a group of other Marriage Minded Individuals. 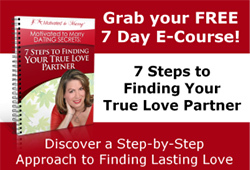 You will receive weekly lesson guides that will take you through my step by step system for finding true love. You will have access to each module’s audios, and their transcripts if you happen to miss one of the live program calls or just to refer to in the future. We will have live questions and answer teleclasses where I will coach you through where you are stuck. You will also have access to the group’s private forum for sharing information and posting questions all through the program and even beyond. You will walk away with your very own personalized dating plan for finding true love. This group currently takes place about twice a year. If you’re interested in Coach Amy’s next Motivated to Marry Group Coaching program, click here to contact me to find out when the next group will be starting. If you are not ready to move forward with coaching at this time, then find out about my affordable, impactful self-study products. Your Motivated to Marry® Coach! 1 Pings/Trackbacks for "Private Coaching"